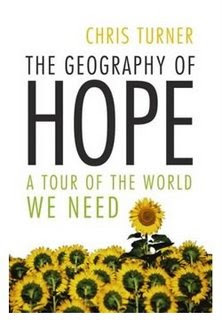 The long anticipated draw for our two copies of Chris Turner's The Geography of Hope is finally over. Utilizing the cheap labour costs and impeccable integrity of my children, I put them to work (after they were done sewing up that last pair of Nikes' that is) drawing the two winners names. So, you two winners, we will be seeing you at the big SCALEDOWN UNVEILED launch party this Wednesday evening where you can pick your copy up and get Chris Turner to sign it for you Congratulations again and a big Thank You goes out to Random House for providing the giveaway copies of the book! Posted by Chris Holt at 4:41 p.m.
February 19, 2008 at 3:38 a.m.
February 19, 2008 at 7:21 a.m.
Good I didn't win, so now I don't have to go... phew! February 19, 2008 at 8:10 a.m.
Congrats to the winners! I have to work tonight..Wedensday and can't make the big event..darn. But will purchase the book online. February 20, 2008 at 7:45 a.m.